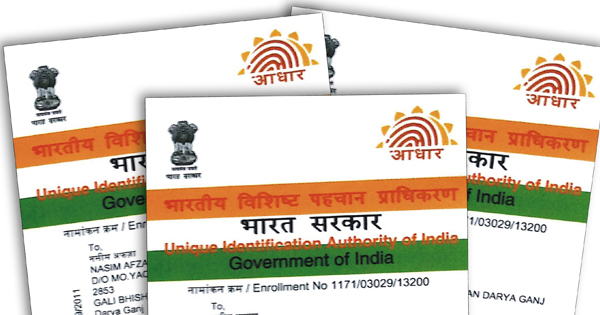 India’s Aadhaar card or the Unique Identification Number (UID) is the 12-digit identity number based on biometric data issued to each resident of India by the Government of India. Aadhaar card is meant for establishing unique identity of residents of India. It will eventually serve as a proof of identity and address, across India. It has nothing to do with a person’s citizenship. Aadhaar card CANNOT be used as proof of Indian citizenship. As per the Aadhaar (Targeted Delivery of Financial and Other Subsidies, Benefits and Services) Act, 2016, only a resident individual is entitled to obtain Aadhaar. Resident as per the said Act means an individual who has resided in India for a period or periods amounting in all to 182 days or more in the 12 months immediately preceding the date of application for enrolment. Accordingly, the requirement to quote Aadhaar as per section 139AA of the Income-tax Act shall not apply to an individual who is not a resident as per the Aadhaar Act, 2016. Any individual, irrespective of age and gender, who is a resident in India and satisfies the verification process laid down by the Unique Identification Authority of India (UIDAI) can apply for Aadhaar card. NRIs, PIO’s, OCIs as well as foreigners, living in India can also apply for Aadhaar card. There is NO online process by which and OCI and POI can apply for Aadhar card. Overseas citizen of India (OCI) and Person of Indian Origin (PIO) are also eligible to take aadhaar cards, and need to appear in person at Aadhaar enrolment center to process the card. They would need to make a trip to India and be present at the selected enrolment center physically. Visit Pre-enrolment portal, submit your demographic information. Find nearest enrolment centre which you are comfortable to visit during your trip to India and book an appointment. Visit the aadhaar enrolment centre on your appointment date. Give your Fingerprint scan and iris scan. Check the details for any typos. Take acknowledgement slip which contains your demographic information, enrolment number, date and time of enrolment etc. The Enrolment ID can be used for tracking the status of your application. You can check the status of your aadhaar card here. Please note that this page is accessible only in India. You will need your acknowlwdgement number and active mobile number to check your status. Wait till you get your aadhaar card. Download and print your Aadhaar card. Note: Keep your mobile number active till you receive your Aadhaar card. From insurance policies to mobile SIM, the UIDAI (Unique Identification Authority of India) has mandated the 12-digit for carrying out a number of tasks. Aadhaar card has to be linked with small savings schemes such as Kisan Vikas Patra and PPF (Public Provident Fund) as well as bank accounts. Applying for a PAN (Permanent Account Number) card for filing of taxes also requires quoting of Aadhaar. Though, it doesn’t replace the existing identification documents, it can be used as a single identification document at healthcare institutions, government bodies, financial organisations, among others that can use it to identify and verify an Aadhaar holder. This article has been complied from various online sources. Do let us know if there are any errors or omissions.